In top restaurants there's a table reserved for a select few, providing exclusive access and one-on-one interaction with the chef. Unfortunately, that exclusivity comes with a hefty price tag, one that's out of reach for most people. At our Chef's Table Events, foodies meet the chef in an intimate - and affordable - setting. Chef's Table Events bring foodies together in an exclusive, intimate setting. Each restaurant we visit takes care to show off its best, and each experience is exquisite. Whether it's barbecue and beer, tapas and sangria, or Italian and wine, each event is unique and is an ideal way to explore Chicago's culinary scene without spending a fortune. You can join in the fun and make it even more affordable with a Chef's Table Membership. You'll receive ten tickets for the price of eight, plus you'll be the first notified of new events and will get to save your seat before anybody else. We guarantee your spot for the first week after an event is announced. You can attend ten events on your own or you can bring a friend. It's also perfect for couples: you've got five built-in date nights! Membership is transferable. If your membership is about to expire, or if you just want to share it with a friend, you're free to do so. Occasionally we'll host premium events with a higher ticket price. Members pay the difference between that price and $35. 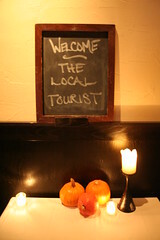 Join this exclusive club today and start your tour of The Local Tourist's Chef's Table Events!